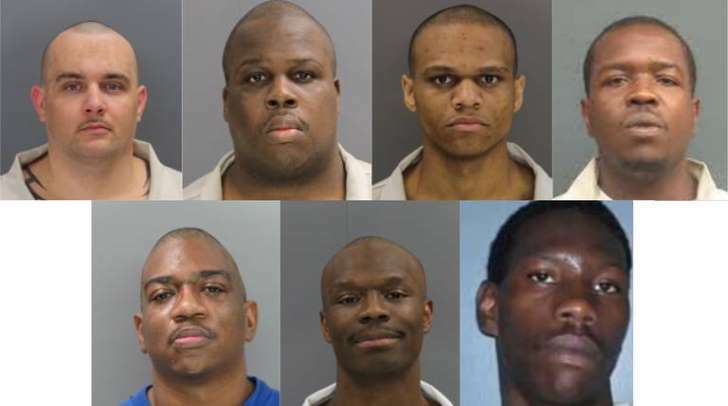 The seven were killed during fights and 17 others inmates were injured that lasted more than seven hours at the South Carolina prison Sunday night and into Monday morning, the S.C. Department of Corrections announced early Monday morning. Though most of the autopsies have yet to be performed, it appears that many of the prisoners died from stabbing or slashing wounds from "shanks," Lee County Coroner Larry Logan said. The official cause of death will not be determined until after the autopsies. Raymond Angelo Scott, 28, was incarcerated in July 2016 for charges of assault and battery, carrying a prohibited weapon and an additional weapons charge, according to Department of Corrections records. He was sentenced to 25 years for the charges, which came from Sumter County. He was placed in Lee Correctional Institute on Oct. 18, 2017. Scott, of Charleston, robbed a business in Sumter County, shooting the store's clerk in December 2015, according to the Sumter Item. Milledge, 44, was moved to Lee on Nov. 13, 2017. He was incarcerated in April 2010, and sentenced to a total 66 years for assault and battery, illegal drug possession, possession of narcotics, trafficking in crack cocaine and an additional firearms charges. The charges came from Marlboro and Greenville county. Rivera, 24, was serving a life sentence for murder, armed robbery, burglary and kidnapping. He was charged in Georgetown County and incarcerated in November 2015. He was transferred to Lee Nov. 2, 2017. Gaskins, 32, was incarcerated on domestic violence charges in Berkeley county. He began serving his 10 year sentence in December 2017. He was transferred to Lee April 13, 2018, though he served time in Lee starting March 29. In Sept. 2016, Berkeley Deputies were called after Gaskins showed up at the home of a woman he was previously in a relationship with and threatened her with a shotgun, according to the Post and Courier. Jenkins, 33, arrived in Lee Jan. 19, 2016. He was serving a 32 year sentence for burglary, voluntary manslaughter and attempted murder. Jenkins was charged in Orangeburg and Berkeley County for his crimes, and began serving his sentence in December 2015. Corey Scott, 38, was charged with assault and battery, criminal conspiracy, carjacking, aggravated assault and battery, kidnapping and armed robbery in McCormick and Florence counties. He began serving a 22-year sentence in October 2002. While in prison, he received an additional assault and battery charge and an eight year sentence to run concurrent with his 22-year sentence. McClary, 33, was serving a 42 year sentence for assault and battery, burglary, criminal conspiracy and firearms charges when he arrived at Lee Oct. 2, 2017. He was arrested in Williamsburg County in November 2009 in connection with the shooting death of 54-year-old Ernest Prosser. The Williamsburg County Sheriff’s Department said the motive behind the murder was robbery, SCNow reported. Prosecutors dropped the murder charge against McClary, who later pleaded guilty to criminal conspiracy, first degree burglary and possession of a weapon during a violent crime. He was sentenced to 25 years in prison.